In early March I was laid up with a vicious cold for about two weeks. It rendered me speechless (literally) for a few days and just miserable for much longer. I sat like a rock on the sofa all day, watching television and trying to concentrate on the subject at hand through my fogged out brain. Because I wasn't too terribly sick, I got fidgety and decided to pick up the needles and knit some squares for the local charity knitting group I've been working with. Although I knew I couldn't concentrate very well on my own scarf project, I decided that even if I was a bit foggy in the head, I could manage a simple knit square. For the most part I did. I knit five of them with no problem. It was the last one that somehow grew on the needles and subsequently became a not very attractive tarot bag for me. 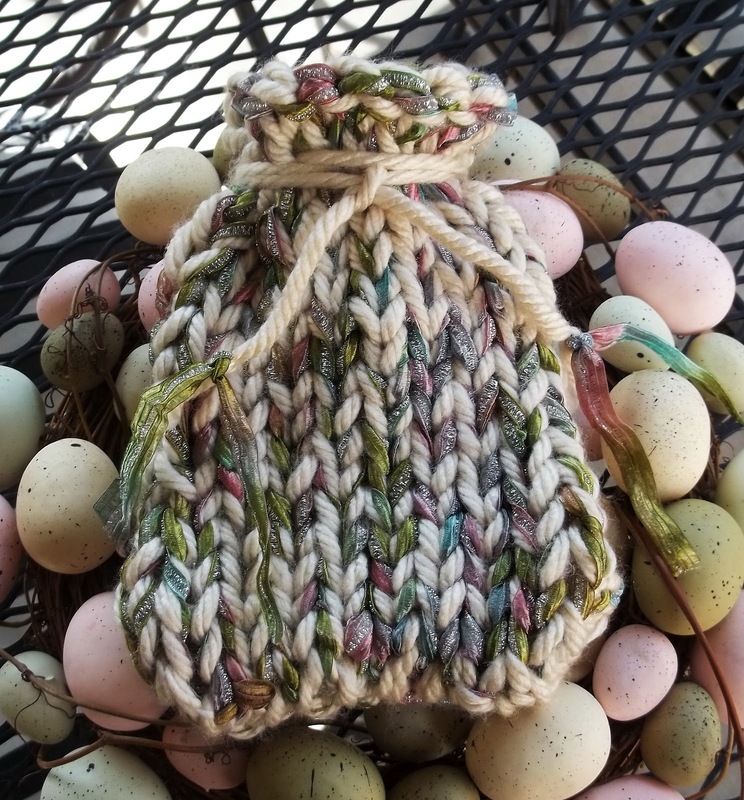 I moved on from the squares to making a couple of what i like to call "Fairy bags". They are a big bigger than a tarot bag, and have a ribbon with a sparkle that is knit with the yarn. I really had a good time creating them. these are on sale in my Etsy store since I actually like the look of them. 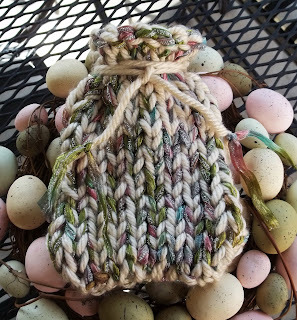 The one shown here is called the "Ostara Fairy Bag" I really like the way this one turned out with it's muted colors. I've had the ribbon for a while. I had bought several colorsways of it on sale several years ago. It's by Louisa Harding. I might just try to find more now that my stash of it is gone. I was feeling quite chipper by the Spring Equinox and while dyeing some eggs to celebrate Ostara, i got the brilliant idea t o dye some yarn I had, using the egg dye. I got on Google and sure enough, found directions for it. it was a good start that left me with lots of ideas for future color combinations. 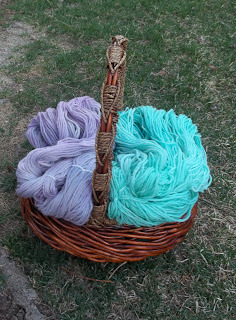 I am pretty happy with the pastel purple and green because it's oh so very Spring like, even if they are not the normal colors I work with. Different can be good. Now that i am fully recovered from my cold and my taste buds are back, I have happily traded in my orange juice for some very dry Martinis. Gin, of course. Cheers!